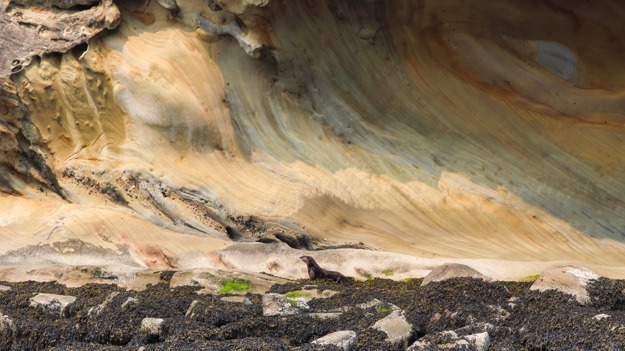 In August, the 5th month of our 6 month cruising plan, we went from the Gulf Islands to Garrison Bay in the San Juans. August was a *BIG* change from our previous months. We didn’t go very far, and many times we stayed in the same anchorage for 3-4 nights. This was our plan all along though – we wanted to hang out somewhere nice, yet not go very far at all, because August is typically the worst month for sailing. 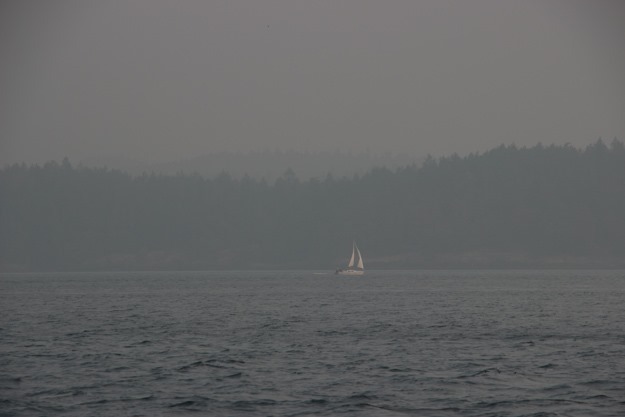 The first week we sailed through the Gulf Islands (early August had great wind!) and then we spent the next 3 weeks bouncing between Friday Harbor, Sucia Island, Shaw Island (Blind Bay), and Deer Harbor. The San Juans were starkly different in August than when we came through in April. They were super busy, with motorboats zooming everywhere and the marinas and anchorages were all very chaotic and busy. This took some getting used to, after months of sparse boat traffic (July was a bit busier, but August noticeably more so). But we enjoyed the short days because it gave us lots of time for hiking, photography, blogging, catching up on boat chores, etc. 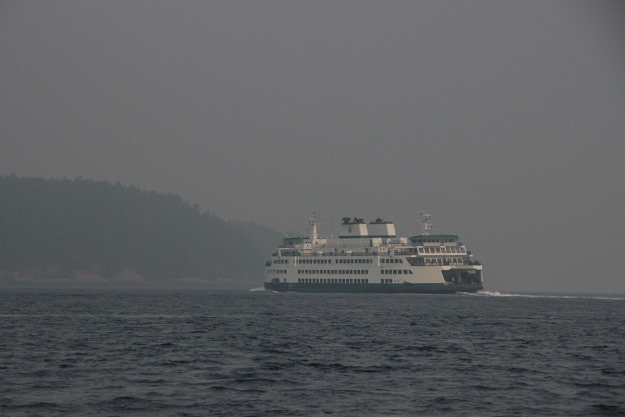 The #1 impact on our August cruising though was the forest fire smoke. 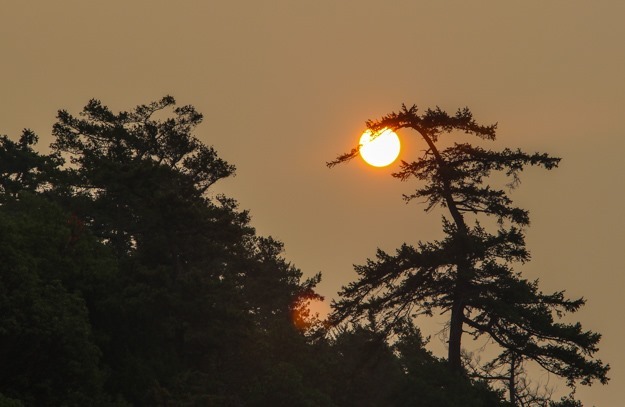 I’ll talk more about that under Weather, but the short version is that the Pacific Northwest has been blanketed by dense forest fire smoke for the last few Augusts, and it really puts a damper on being outdoors. Highest wind speed while sailing: 20 knots (Gulf Islands). (If you don’t count that first week though, the highest wind speed we had in August was 13 knots – the lowest peak of all months so far). At Snoring Bay on Sucia Island. Note the river otter in the lower middle. About 8 of these guys were later chowing down on little fish just a few hundred feet from our boat. The first week of August was much like July – sunny and warm. It wasn’t as hot as July was, where we had many 90+ days. As of August 24, we hadn’t had rain in over 45 days, which felt really weird. The boat deck and windows got quite dirty and salty, without the free rain rinse that would normally happen. After the first week, August weather became quite terrible honestly. The light wind part of August set in, but what really bothers me is the forest fire smoke. 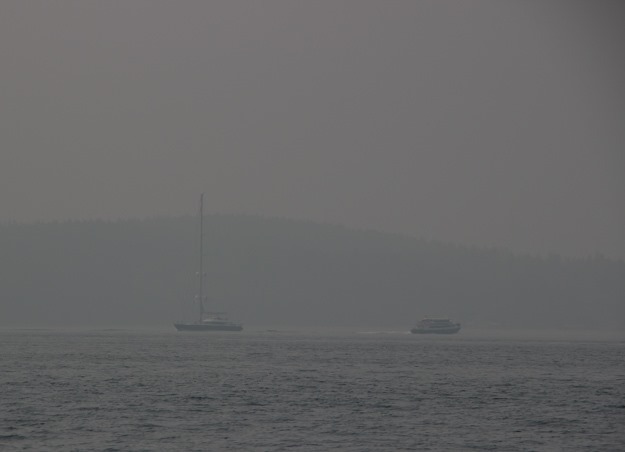 I don’t recall Seattle ever having smoke 10 years ago, but it’s become a regular phenomenon for the last few years. Forests across BC, eastern Washington, and California erupt into thousands of acres of fire, blowing smoke over the region. It makes for some very orange sunsets but also blots out the horizon (decreasing visibility) making the air feel muggy + heavy. Air quality drops (reportedly to levels below that of smog-ridden Beijing), and organizations put out warnings rating the air “unhealthy.” The sun’s output is so reduced that our daylight hours feel shortened, and our solar panels produce 50% less power. This is a picture of the 135 foot superyacht “Clan VIII”, only a half mile from us. Somehow we crossed paths with Clan VIII three times this summer, first seeing them in Campbell River refueling. The last week of August got pretty chilly (for August), with a fall-like chill setting in. The boat was often 55F in the morning, and some days the high temp was 64F. The first week of August, in the Gulf Islands, we had southeast wind every day, starting about 8am and lasting till 5 or 6pm. The wind was quite strong for August – about 15-20 knots instead of the typical 2-8 kts. And the duration was generous – 8-10 hours of usable wind instead of the more typical 4-6 hours. The rest of August turned to mostly light wind or no wind days, but about 50% of the days were light wind (5-10), which is still great sailing wind for us if you don’t have to go very far – as you generally don’t in the San Juans when you’re doing 3-6 nautical mile hops. So we were able to sail more than I expected, when making our anchorage moves every 3 days or so. In the San Juans the wind was southerly most of the time, so perhaps contrary to conventional wisdom, we had southerly wind for 80-90% of August. The Turn Point Lighthouse at the tip of Stuart Island. This sharp turn at the top of Haro Strait is a bit of a blind turn, with container ships rounding it at 20 knots – best to check your AIS (available on cellular phones) if you’re not sure whether you’re in the path of approaching traffic! The San Juans has a nice system of mooring balls at most of the islands with marine parks. 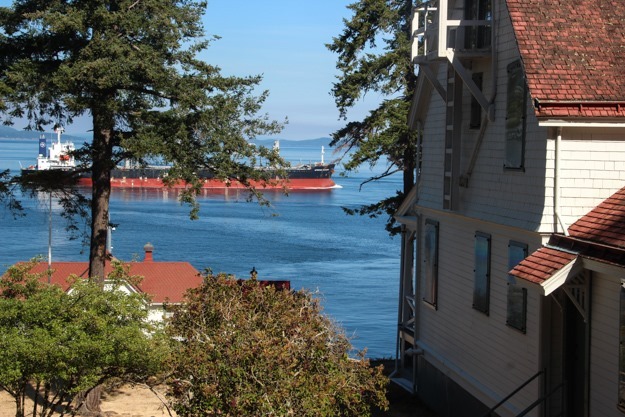 You can pay per night ($15) or buy an annual moorage pass ($190 for our boat) which covers unlimited use, up to 3 nights in one place. The crossover point where the annual pass pays off is about 13 nights (assuming you don’t use the docks, which we rarely do). The main advantage of mooring balls is convenience – not having to raise and lower your anchor. For us that’s a pretty big convenience, because we hand lower our anchor and raise it with a manual windlass (rather than the electric windlass most 35’+ boats have). Other smaller advantages are that your swing circle is decreased (less moving around in tide/wind) and a mooring ball has defacto rights to the water around it (if someone anchors too close to a ball, they have to move). Also if you’re not confident in your anchor or technique, there’s no worry about dragging. In the summer in the San Juans though, often all the mooring balls are taken when we arrive. They go through a “changing of the guard” between 10am-1pm when boats leave to motor to their next stop. But if you’re aiming to sail, you usually arrive about 4-6pm, because there’s typically no wind in the morning. So we usually anchor near the mooring ball field instead, which is fine. But then when a ball frees up the next day from 10am-1pm, do we move? That’s the big debate. It’s pretty illogical to move, since the primary purpose of the mooring ball is to save the trouble of raising and lowering anchor, which we would have to do in order to move to a mooring ball. Yet we see many boats do this, and we feel the temptation as well. An economist would probably say it’s a classic example of irrational market behavior. Since the mooring balls have a price attached, they have perceived value, and this makes people desire them even if that value isn’t applicable in the present moment (when we’ve already anchored). These are some of the things you think about when you’ve been cruising for 5 months. Tohatsu outboard: the 3-month running saga of our outboard issues continued. With more time to troubleshoot the issue (oil pressure light coming on, plus a very rare power loss issue), I reached out to a mechanic in Friday Harbor and one online. So far I still haven’t found the cause. Leaky holding tank – our holding tank started leaking a bit at the pumpout fitting on top of the tank when it’s full. No fun! And then when we pulled up to the Deer Harbor pump-out, they told us it was broken for a week! 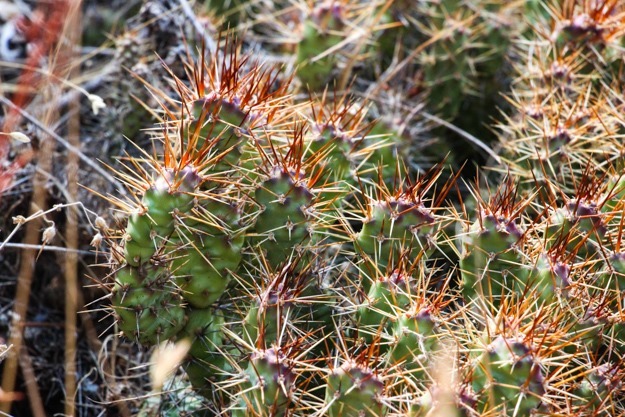 Although we had a couple thorny issues, nothing like this Pacific Northwest desert cactus on Jones Island. One last thing that has been tough in August in the San Juans has been how many anchorages have been rather rolly. Normally we don’t mind a bit of rolliness – it’s part of cruising – but perhaps we’re a bit stability fatigued (having been on a dock only about 5% of the time in the last 5 months). It can be tiring to have your home rolling and yawing regularly. In the Gulf Islands we found nice calm anchorages, but in the San Juans perhaps we’ve been picking the wrong ones – or the San Juans are just more bumpy than the Gulfs. Nearly every anchorage we’ve been in receives ferry swell, motorboat wake, or current/wind induced waves. Sucia (Echo Bay) was surprisingly rolly (some combination of motorboat wake + current interaction with SW wind with a slight SE component), Friday Harbor is always rolly (ferry swell, high speed dinghies, motorboat wake), Indian Cove was pretty good but still gets ferry + motorboat swell, and Jones Island (north side) is a bit better but still gets motorboat wake. Even Blind Bay (Shaw Island north side), a place you’d think is perfectly protected, was exposed to hourly ferry swell and wake from passing high speed motorboats. Overall we realized we like the San Juans more in April and May than in August, despite the cooler and rainier conditions of the early season. August is peak season, which brings nice weather but also very crowded, busy, wake-strewn anchorages. This means a whole set of complications that aren’t present other months – noisy generators running, party boats, rolly anchorages from motorboats racing around. We’ve even had jet skis speeding through the anchorage at 30 knots. Another complication is having to worry about other boats dragging anchor into us or setting their anchor on top of ours or too close. We’ve seen several boats drag in only 15 knots of wind in anchorages with good holding, which really shouldn’t happen with a well set anchor. 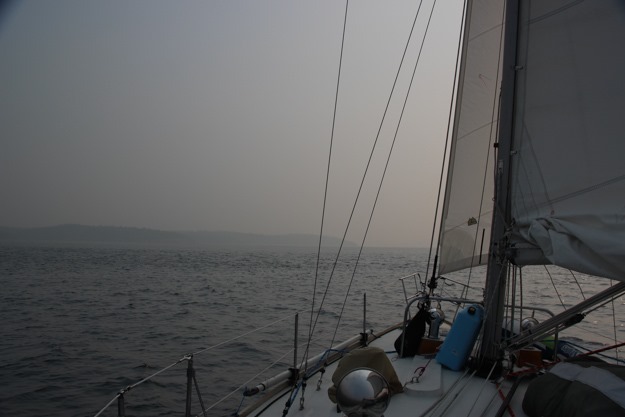 And of course, it’s windless much of the time in August, which makes for glum sailing, and the forest fire smoke haze put a big damper on things. Sorry for all the complaining. We still love being on the water. August was a tough month though. We’ve struggled to figure out why we had a hard time in August – probably some combination of cruising fatigue plus all the other factors (smoke blanket, low wind, crowded San Juans, etc). It really seems strange that August is considered the most desirable cruising month amongst cruising communities, when it has so many disadvantages compared to other months. 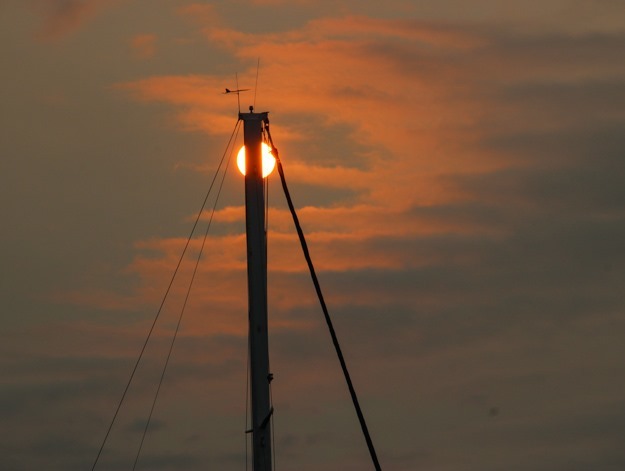 Maybe people will start catching on and booking their charters in June, July and September when the sailing is much better and the region isn’t under a blanket of smoke. Looking forward, we’re pretty excited about September – our cruising club, PSCC, is doing a raft-up in Garrison Bay, and we’re going to attend the Wooden Boat Festival at Port Townsend, catching up with some folks we haven’t seen in a while. Oh, and we’re really looking forward to some rain, wind, and no smoke! This entry was posted in cruises, summary on September 1, 2018 by Patrick.